Book Review originally published here: http://www.iheartreading.net/book-tou...I had some trouble with Snake in the Grass first, because it’s the fourth book in a series, and I hadn’t had time to read the other parts before I started this one. But once I got the hang of things, and figured out who was who, the book turned out to be a pleasant read. I’m sure kids will love it.The characters are interesting and three-dimensional, in particular Jaycee. She’s very authentic, a good representation of middle school girls, what they care about, what they don’t care about, and what matters to them. Yet at the same time she’s not generic, but special, creative and imaginative, and also quite brave.I particularly liked the scenes in Mallory, the whole storyline with the missing envoy. The plot worked, in Mallory as well as in the regular world, and you soon feel for these characters, and want them to succeed. The dialogue is spot-on, and sounds very realistic, especially Jaycee’s dialogue. The book also has an appropriate amount of humor, which kids will like too.It’s an imaginative, well-plotted adventure that I’d recommend to middle graders and young teens. And occassionally, an adult who enjoys middle grade books (like me, for example). Charming book with a great message. While I have not read the other books in the series, it was fairly easy to pick up the main idea and follow along with the story. Reading the whole series would have been beneficial but I was able to follow along without much problem.The basic premise is that a girl jumps into a video game world set around the time of Knights and castles and becomes the champion of the region. In this story she get called to the realm to provide emotional and psychological strength to the ruler. However thing unravel quickly leading her to be needed in her role of champion.This was a quick read for me and is perfect for the younger reader, upper elementary school and middle school readers. The story also talks about standing up for those who cannot or will not stand up for themselves and putting yourself out there to take a chance. I love the message and the great story that presents it.I give this book 4 out of 5 clouds. M.E. Sutton - Mary Sutton has been making up stories, and creating her own endings for other people's stories, for as long as she can remember. 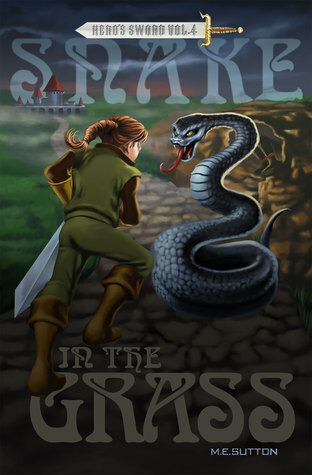 After ten years, she decided that making things up was far more satisfying than writing software manuals, and took the jump into fiction.She writes the HERO'S SWORD middle-grade fantasy series as M.E. Sutton and finds a lot of inspiration in the lives of her own kids. A lifelong mystery fan, she also writes crime fiction, including THE LAUREL HIGHLANDS MYSTERIES, under the pen name Liz Milliron. Her short fiction has been published at Uppagus, Mystericale (Fall 2013), and in LUCKY CHARMS: 12 CRIME TALES (December 2013).Like her LAUREL HIGHLANDS characters, Mary lives in Southwestern PA (but, unfortunately, she doesn't have a dog). She is a member of Sisters in Crime and Pennwriters.Visit her on the web at marysuttonauthor and follow her on Twitter (@mary_sutton73).